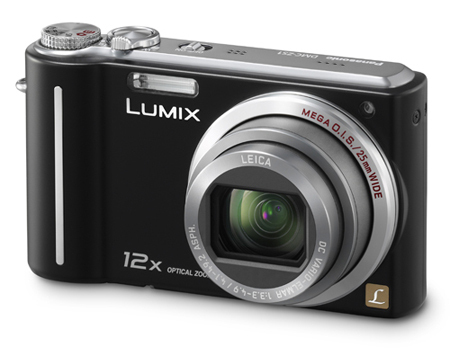 New for 2009 from Panasonic is the Lumix ZS1, a 10.1-Megapixel compact digicam with a very large optical zoom. One of the main features is the Leica DV Vario-Elmar 12x optical zoom lens with a 35mm equivalent of 25-300mm, which adds a great deal of versatility to the camera. Other features include iA (intelligent auto) mode, 2.0fps unlimited continuous shooting, WVGA (848x480) video recording and a 2.7-inch LCD. iAuto shooting mode by Panasonic has the ability serve up to 7 functions automatically for you while you shoot. Face Detection and Face Recognition not only give the camera the ability to find and track faces for great exposures, it can also recognize specific faces for higher priority. AF tracking and MEGA O.I.S. make following moving subjects easy as the camera's auto focus tracks your subject. While this is going on, the MEGA O.I.S. keeps the camera steady. The last 3, INtelligent Scene selection makes sure you are always in the propper shooting mode; Intelligent Exposure and ISO assure you that you always have a propper exposure and high enough ISO for a crystal clear picture.